For Sunday, March 13,2016 (If the weather is favorable) I organize a snowshoe hike to Pointe de Fornet 2300 m. This summit is situated on Franco-Swiss border and take part of Chablais Massif. 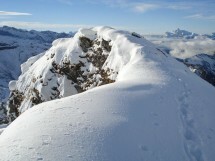 It is located on the ridge separating Valle de Morzine (France) from the Val d’Illiez (Switzerland). We start from Erigné-Devant 1220m (Morzine, Valée de Manche). Trough Lac De Mine D’Or and Chalets De L’Aiguille we arrive at summit. Panorama over Avoriaz, Valais, Dents du Midi … etc. Elevation gain: 1100m. Length: 10km. For experimented and sporty hikers.